Poultry diets are made up of a mixture of several different feedstuffs including cereal grains, soybean meal, animal by-product meals, fats, and vitamin and mineral premixes. Together with fresh water, these elements provide the energy and nutrients essential for the bird’s growth, reproduction, and health, writes Laura Elliott. 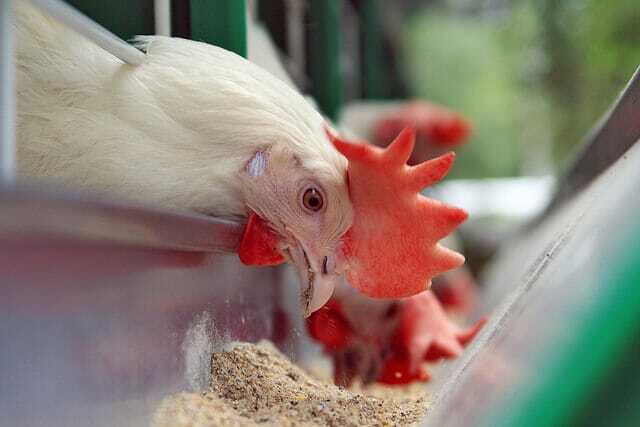 Poultry convert feed into useful nutrients quickly and efficiently. They have a relatively low environmental impact compared with other farm animals, but their high rate of productivity means that they do require moderately high nutrient maintenance. In this article, we take a look at the basic requirements for an optimal and well-balanced poultry diet. Water is an essential part of life for all poultry and livestock, but the amount required for adequate health and productivity will vary depending on the temperature in which the birds are kept, the bird’s growth rate or level of egg production, and the individual’s ability to reabsorb water through the kidneys. Any level of water deprivation exceeding twelve hours will have an adverse effect on the growth of poultry and the egg production of layers. Water deprivation exceeding 24 - 36 hours will more often than not result in death. It is particularly important to consider water availability for chicks. The baby chick is about 79 per cent water, and it cannot drink a lot of water at once so it has to drink often. It’s therefore vital to provide cool, clean water for your poultry, and ensure that it’s accessible to them at all times. Dietary carbohydrates are important sources of energy for poultry. Corn, wheat, and other cereal grains are the main carbohydrate component of most poultry diets. The starch in these foodstuffs is readily digested by poultry, but other carbohydrates occur in varying levels of concentration in cereal grains and protein supplements. Certain types of dietary carbohydrates aren’t easily digested by poultry, so it’s always best to add appropriate enzyme preparations to supplement diets of rye or barley and improve the nutrient absorption in a non-starch based diet. If such diets aren’t properly supplemented, they’ll contribute very little to meeting the energy requirements of your flock. The dietary requirements for protein are actually requirements for the amino acids found in dietary protein. Poultry use these amino acids to fulfil a number of functions, including using them to make up the bulk of their structural and protective tissues such as skin, feathers, bones and ligaments. Amino acids also help form the soft tissues including the organs and muscles, as well as playing an important role in the metabolisation of feed into energy. Failure to provide adequate protein in your bird’s diet will result in a number of structural and health problems for your flock, as well as reducing yield of meat or eggs. However, it’s important to remember that poultry protein and amino acid requirements can vary considerably, depending on the rate of growth or level of egg production of the individual bird. Turkey poults and broiler chickens have high amino acid requirements so they can meet the necessary rapid growth, for instance, and the mature rooster requires fewer amino acids than the laying hen, even though its body size is greater and feed consumption similar. The percentage requirements of protein and amino acids must also increase if you keep your flock in warmer environments, when metabolisation is far quicker. In general, protein and amino acid percentages are some of the trickier nutritional balances to get right for poultry production, so it’s best to fully research the breed you’re working with, and tailor your feed to them specifically. Generally speaking, fat is usually added to the feed for meat-type poultry to increase overall energy concentration, and thereby improve productivity and feed efficiency. Feed-grade fat tends to come from different sources, including grease from restaurants, the rendering of animal carcasses, and the refuse from vegetable oil refining. Nevertheless, all feed fats should be stabilised by an antioxidant to preserve unsaturated fatty acids, and when animal tallow is added to feed at a low level, it might be nutritionally beneficial to blend it with a small amount of vegetable oil. This is because the metabolic value of a fat blend is better than a singular addition. Corn is a particularly advantageous fat source because its fatty acids are mostly unsaturated, and it usually constitutes a large portion of existing poultry feed regardless. Minerals are the inorganic parts of feed or tissues. They are required for various functions within the bird. For example, calcium and phosphorous are vital in the formation of the skeleton, and sodium, potassium, magnesium and chloride function to stabilise the pH levels throughout the body. In the diet of growing birds calcium is used for bone formation, whereas the bulk of calcium rations in laying hens is usually used to form the eggshell. If a hen does not receive sufficient calcium in its diet for eggshell production, it may use reserves of calcium from its skeleton, but this resource will be rapidly depleted and the hen will stop laying. Backyard producers often use oyster shells or ground limestone to add calcium to their flock’s diet . It is easy to find general mineral supplements for addition to poultry feed, although again, it’s best to research your specific breedin a more in-depth way before working out percentages. Vitamins tend to be classified under two different categories: fat soluble vitamins, A, D, E, and K, and water-soluble vitamins, including the B-complex and vitamin C.
Ensuring layers are well supplied with the vitamin A precursors known as carotenoids gives the golden yellow yolk that consumers demand from their eggs. Vitamin C isn’t usually required as an additional dietary supplement for poultry, as it’s already synthesised by them. However, it has been suggested that poultry under stress respond well to its addition in the diet. 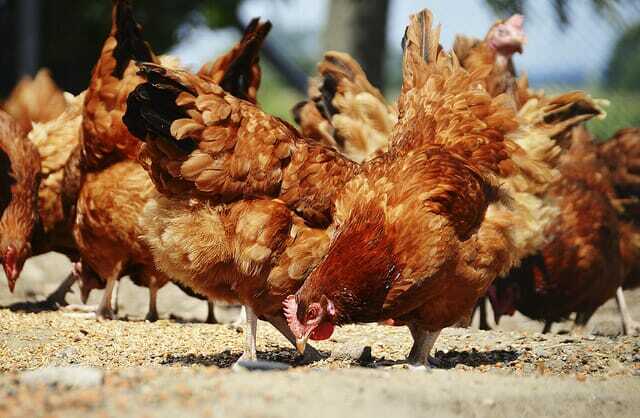 Dietary supplements for poultry tend to contain high levels of vitamins that are considered well in excess of the minimum requirements, so as long as your flock is receiving adequate supplement to their feed, it is unlikely they will be deficient in any of the main components. A more in-depth guide to recognising various vitamin deficiencies in poultry is included in this issue, and can be found here. This is a rough guide to the main dietary requirements of general poultry flocks, originally published in the March 2016 edition of ThePoultrySite Digital. For more, read other articles from the issue by clicking here.